You are not alone, brothers and sisters, you who are trolling the shops and sighing deeply, with no sugarplums dancing anywhere near your befuddled head. We feel your pain. And, yes—somebody say Hallelujah!—we’ve got good news: a great, easy gift idea! This is it, a great gift idea you can get, right here, right now, at home, easily. It would be good for almost anybody, young or old. And it is way cool. 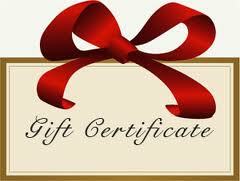 You can make your own Hearts & Minds gift certificate. All you have to do is give us your credit card info, tell us how much you want to spend, and tell us who it is for. We’ll make a record of it here (and will promptly confirm it with you by sending a number, so they know it isn’t you just pretending to give them a gift, what with your crayony scrawl on your kid’s construction paper and all.) (Okay, I take that back: maybe you are a gifted scrap-booker and can make a truly stunning and very textured little thing or an art major and you’ve already got the vision for some dashing water-color wash, with the dollar amount in pen and ink. Have at it.) No matter how you make it, we’ll send a little number, just to make it official, which you can put on the card real tiny on the back. You can DOWNLOAD this interview with me talking about our bookstore and put it on a disc to listen to. Let your friend or loved one hear how we see our calling to help folks make sense of their lives by doing this bookstore thing, why we promote reading widely, how we are eager to help customers connect the dots of their lives, providing books and music that are sometimes a bit hard to find or off the beaten path. This fast-paced, hour-long interview was professionally broadcast and recorded on VoiceAmerica talk radio, with me being interviewed by a dear friend, life coach Jory Fischer, for her show “Heart & Soul with Jory Fischer.” Let them listen to the interview and understand our take on the joys of reading and discerning a sense of purpose and calling, and why perhaps Hearts & Minds might be an interesting place from which to order some books. With the gift card you made yourself. You can actually do what he recommends in A Million Miles… in that great story about his lawyer friend Bob Goff, who is described as starting (with his kids) a New Year’s Day parade in their neighborhood. Only thing is, nobody on the street was allowed to watch the parade. Everybody had to be in it! Miller explains that Bob thought that it isn’t good enough to tell a better story. We then should invite people into that story. We would like to think that you believe that shopping here has been part of a purposeful story you are telling with your life. Supporting independent businesses, ordering books from somebody you trust, talking about the most important stuff happening within the religious community, learning to make a difference, being comforted and delighted, instructed and challenged, by the authors we suggest or recommend. Why not invite somebody else into this story? Yeah, why not bring them into the Hearts & Minds family of friends? Download the audio interview with me, burn it on a CD, and wrap it up and give it with the gift certificate as a way of explaining why you support Hearts & Minds, how we might serve them, and why your made that scrawlly little (or very lovely, or large, for that matter) home-made gift card. And why we are crazy enough to honor it. Thanks for your support this year, thanks for caring about sharing good books. Or hand-made gift cards, as the case may be. Merry Christmas, one and all. We’ll email you the confirmation number for you to put somewhere on the gift certificate.You do the rest.